NTA has released the CMAT hall ticket 2019 on January 7, 2019. The CMAT 2019 Admit card down load is available till the CMAT exam date on January 28, 2019 from the official NTA-CMAT website. The CMAT Admit Card download process can be completed by login at NTA-CMAT website either through your CMAT 20219 Application number and password or through your Application number and date of birth. One of the most important things to check in CMAT Admit Card 2019 is your specific CMAT test session as this is the first time that CMAT exam is held in morning and afternoon sessions. 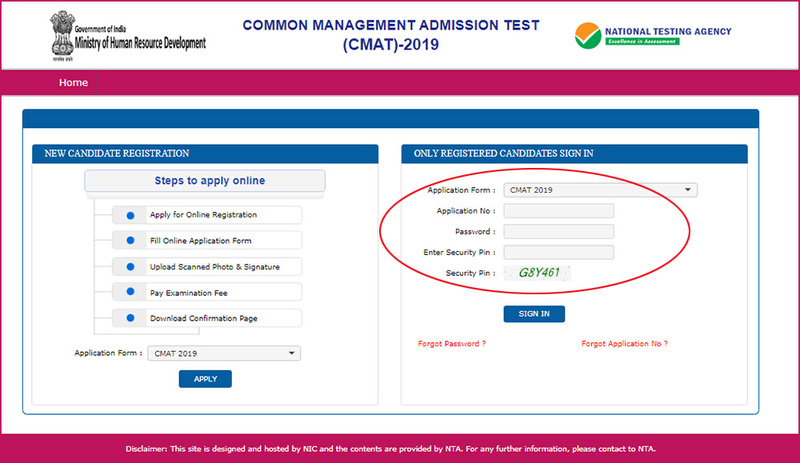 CMAT 2019 hall ticket download is available only for the candidates who have successfully registered and have paid the CMAT 2019 application fee by the stipulated date. No hard copy of the CMAT Admit card 2019 will be sent to any of the prospective CMAT 2019 test takers. In case of non receipt of the CMAT 2019 Admit Card or any error in the details, you should contact NTA office over phone or on their email id. If you wish to get any details in the CMAT 2019 Admit Card changed, it may not be possible now. Although you may contact the helpline but no correction in the submitted data would be allowed as the information in the admit card is retrieved from your CMAT 2019 registration form. 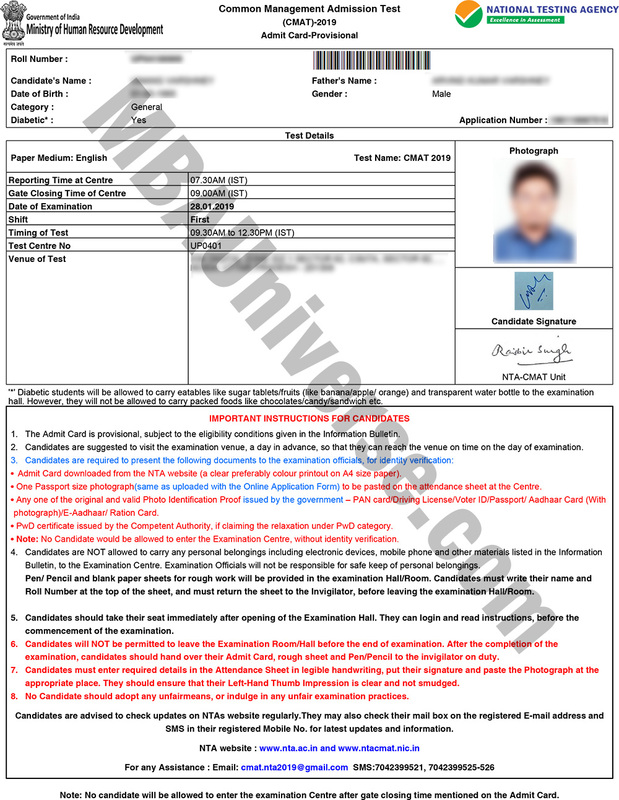 If there is any change in your personal details like academic qualification, address, change in name due to marriage or any other reason or in any other details, you will be able to produce the relevant proof at the time of submitting your application for admission or during the PI round at the MBA college where you have applied. Nonetheless, if there is any mistake that you find in the Admit Card, you should send the correction request to National Testing Agency on mail as well as on helpline. NTA suggests not to send the same email multiple times, as it will delay the response process. CMAT 2019 exam will be held on January 28, 2019 as an online computer based test across the country. CMAT 2019 aspirants should note that CMAT Admit Card is a mandatory requirement in order to take the test. CMAT 2019 exam is of 3 hours duration. The exam will be held in two shifts in a single day from 9.30 AM to 12.30 PM and 2.30PM to 5.30PM all across India. The reporting time at the CMAT exam centre is 7.30A.M. for morning session and 1PM for afternoon session. NTA is conducting the CMAT 2019 as a National Level Common Management Admission Test (CMAT) to select suitable students for admission in management programmes for academic year 2019. Since 2016, CMAT has become a yearly exam instead of twice a year test. CMAT is considered to be the second largest management entrance test after CAT. Despite ups and downs and after witnessing a total overhaul in the structure, content and conduct of the exam, it is taken by more than 80000 candidates to explore admission chances in the AICTE-approved PGDM courses in B-schools of India.